Omar Zenhom is the host of The $100 MBA podcast, which won the iTunes award for The Best of iTunes 2014. He and his business partner, Nicole Baldinu, create quick ten minute daily podcasts. Omar talks about his background in education, how to successfully generate buzz for your new podcast, and much more on today’s show. [2:15] The $100 MBA wasn’t Omar’s first podcast. [4:00] Omar’s podcast balances quality between content and production really well. How does he do it? [26:35] What’s Omar’s work flow? [29:50] Who listens to Omar’s podcast? 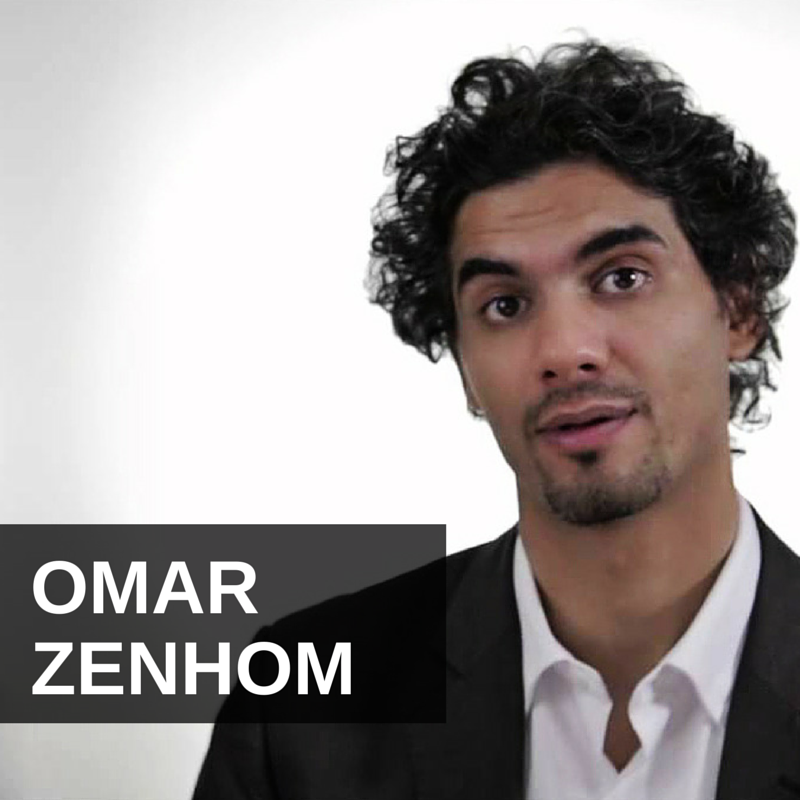 Hey, it’s my pleasure to welcome Omar Zenhom to the show. He is the co-founder of the $100 MBA and Business Republic and he’s host of The $100 MBA show podcast and he put out some great content on how to create a podcast that just can not be ignored and I’m looking to talking to him about that as well as important MBAs and why maybe The $100 MBA is better. Omar, welcome, how you doing? Great, it’s great to be here, Jason, thank for having me. It’s good to have you and you’re coming to us from beautiful, gorgeous Sydney, Australia, is that correct? Yep. We’re here on a little break, but we’ll be back in San Diego shortly. Fantastic and the irony of this whole thing is I happened to be in San Diego today, but I live in Phoenix. So, I’m kind of filling in for you here, keeping an eye on San Diego. Well, tell us about, I mean, your podcast article is fantastic, by the way, so tell us a little bit about what it takes to be successful in podcasting. I have a lot of success in it myself. I think there’s some people who are newer than me. I’m kind of dinosaur starting many years ago, that are newer than me, that are just using some sort of high-tech approaches, maybe hacking the system a little bit and they’re doing amazing things. Yeah. I mean, for us and The $100 MBA show, which is our daily podcast, it’s ten minutes a day, it’s not our first podcast. We actually had a podcast before that that didn’t do as well, actually. I personally would call it a failure, but we learn a lot through the process and when we went to approach launching the $100 MBA, we took a completely different approach and we just decided to see it as a project , see it as a launching an actual product in our business. We gave it the attention it deserved, the attention it needed in order to produce a production that was worthy of noticing, you know, you have to create quality people are going to share, people are going to say, wow, that was great, I want to share this with other people. So, I mean, there’s a lot that comes into it, but that’s basically the philosophy. The philosophy is, as if you’re building an actual, say for example, you’re going to sell and ebook or a training course or anything else online, you would put the work into building this course, into marketing this course, into building buzz about it and we took the same approach with the podcast when we launched and it’s been great. We’ve launched the podcast on August 11th. We’re now on episode 136, it’s a daily podcast, so obviously we rank them up a lot. We’ve had a lot of opportunity open up our way because of that. You know, iTunes awarded us, The Best of iTunes 2014, iTunes just mentioned us one of the best or number one Work Smarter podcast for 2015 and a lot of people have been writing about us in mainstream media like Fast Company and things like that. It’s kind of nice to know that your hard work is paying off, but a lot of people will come and ask me, well, how did you have all the success, what’s the hack? What’s the secret sauce? And the bottom line is, there’s no way to get around the fact that you have to have a good show. You have to have something that is of value. You can’t take this as a side project or take this as something that you just do because you’re suppose to have a podcast. So, tell us more about the quality portion of it? I think so many podcasters are getting caught up in numbers of downloads, they’re not monetizing well, but they are getting lots of downloads or, at least, they say they are, because maybe they’re hacking the system or making it up. I’m not sure and then some are so focused on, you know, quality and equipment and I think they over do it on that perspective. It seems as though you’ve balanced these multiple issues out pretty well. Speak to that, if you would. Sure. In the article, I start out with asking the reading the question, what’s the point? Why are you starting this podcast? If you’re starting a podcast to be successful, that’s not good enough. That’s not good enough for the listener, that’s not good for the audience. You have to actually bring something to the table. You have to answer the question in the listener’s mind, why should I care, why should I pay attention? How do you differentiate yourself, being different in your genre, be it health and fitness or culinary or whatever it is, you know, what you’re doing that other people are not doing or what are you offering or how are you offering it? Sometimes it’s just your delivery, sometimes your just – your character, sometimes it’s just your format, whatever it is, but you have to have something that is of value, something that somebody would say, wow, this is incredible, I would pay money for this. This is something that I don’t, you know, when we started for planning for The $100 MBA, we really set our goal to create our own genre, to create a podcast, because everybody, you know, podcast listeners have their own little categories, like I have an interview podcast I like to listen to. I have kind of conversational banter kind of podcasts I like to listen to, so we wanted to carve out like where the short ten minute daily podcasts that you’re not going to miss everyday and we just felt like there’s a need in the market in the business world just for content driven no-fluff kind of just straight up information where you can take that information and use it that day when you’re working on your business and then build upon it the next day when you listen to our next episode. So, you know, you just got to see what is the point of your podcast. You have to really answer that question and you may not have a good answer immediately and that’s okay, you needed to think about it. It took us awhile for us to come up with that and I mentioned earlier that we had a failure and in that failure we realized that we’re not utilizing our strengths. I’m an educator by trade. I was in education for 13 years, had a bachelors and a master in it, you know, I taught and I was teacher/trainer for over a decade and I wasn’t teaching and I was like, why am I not teaching on the podcast? Why am I interviewing people? That’s not my strength and I kind of used that strength and used that to answer the question, “What’s the point?” What am I doing to help people and add value to their lives. You keep saying we, who is the we in this equation? Sure. I don’t do this alone, I have a business partner and partner in life Nicole Baldinu who is the production manager for everything that we do, videos and podcasting, so I’m the content, I’m the one who teaches, but she’s the one who makes it come together and make it sound amazing, so you know, without her, we would not be able to have a show at all. So, she’s fantastic and that’s a big piece of the puzzle is production quality, you know, if you’re not listen-able. I mean, there’s some big names that have some really popular podcasts out there, but the audio quality is so, I don’t want to say it’s bad, but it’s just not really thought out. It’s not really..
It’s not thought out, it’s not, you’re not really putting in the attention it deserves and you can, you can do great shows, great quality shows with a $40 mic, but you have to edit it properly, you have to make sure you’re appeasing to your audience, you’re making sure that you actually have some sort of format that is applicable to what you’re talking about. Every time we do something new or have a new show or even if we have a new sponsor on the show, we have a discussion and we say, okay, how are we going to incorporate this in this episode and this lesson, how are we going to make this seamless, so it doesn’t effect the audience’s experience. I really do see podcasting as if I’m creating a show, a production, just like you’d do on TV or film, because at the end of the day, that’s where it’s heading. That’s the quality that you’re going to have to produce in order to compete on iTunes or otherwise. So, talk to us a little bit about your monetization strategies? Purely advertising or back-end products or a hybrid of both or something else? It’s definitely a hybrid of both. I mean, we do have sponsorships that, we have sponsors that sponsor the show, but we actually have a course called The $100 MBA that started before the podcast. We launched that of December 3rd of 2013 and it’s a membership course where people can join for a $100 dollars. It’s exactly what it sounds like. It’s an MBA education, it’s practical MBA education where people can learn how to start building their business for $100 and they have life time access to that, to that area, we have over a 180 video courses there, community forums, interviews with experts, and work books for every course, so it’s an interactive way for people to get to know other entrepreneurs as well get feedback from each other, get feedback on their ideas or their logos and their tag lines on their websites, ask questions. Nicole and I are a big part of that community and we try to answer as many questions as we get in the community, so The $100 MBA is kind of the backbone of the show, so when people listen to the show, if they want more, if they feel like this is something I can do a deeper dive in, something that I really want to get to know and really understand and get the how-tos at a deeper level, then they join The $100 MBA, which is not much of a commitment and they get to be apart of the community. So, there are some other projects we’re working on as well that are separate from the $100 MBA brand and the podcast still, you know, creates awareness for that. And, did you go to Wharton business school? Umhmm. The funny thing is that I got my bachelors and I got my masters when I was in education and I was a teacher for a very long time and then after I decided to transition out of my education job and be a full-time entrepreneur, I had this time in my life where I was like, okay, maybe I should go to business school, because if I’m going to be helping people starting businesses, even though I had ten years of building businesses on the side when I was in education, I felt like I needed some sort of creditability, some sort of name or I have to claim that I’ve been to business school in order for people to take me seriously, so I applied to Wharton business school. I got accepted. I was very trilled because, you know, it’s a very, very prestigious school and I attended a semester there and then at the end of the semester, my marketing professor came up to me and said, you know, Omar, what are you doing here? And I said, I’m here, because I want to get an MBA. I think you need an MBA to be a good entrepreneur and he said, you don’t get an MBA to be a great entrepreneur, you get an MBA to get a middle management job at Goldman Sachs or Morgan Stanley. Can I ask, Omar, how old were you at the time when you were attending Wharton for that one semester? I believe I was 32, yep. Okay, go ahead with the story. Yep. So, that was kind of the catalyst for me to kind of think of an alternative business curriculum for people. I read a statistic of the graduating class that I would have graduated from, you know, that graduating class would be $1 billion dollars in debt, which is just insane, you know. I just thought to myself, there’s got to be a better way for people that do not need the piece of paper to get a job, they just need the information so they can be able to have business fundamentals, business skills to start a business, and understand business and excel in business and don’t really need a heavy price tag. So, you know, essentially business schools do not have a monopoly on information, you know, they don’t own that information. You can learn what they..
That’s one fortune for them and the college, I mean, don’t get me too started, Omar, on what I call the college government entitlement complex scam, because student loan debt is over a trillion dollars, it’s not dischargeable in bankruptcy. College is massively overpriced. I mean, when my mom went to Berkeley, she worked her way through college. You can’t really do that anymore. It’s just insane. I mean, it’s, you know, double, triple, quadruple the rate of real inflation for decades now. It’s absurd. By the way, what is the price of a Wharton MBA had you finished, how much debt would you have accumulated? It’s a little over a $130,000. Yes, what a bargain, there you go. So, I mean, that’s one point, the financial debt and the financial burden, but the other thing is that I was in education, I taught in universities, I was a middle manager, you know, so I was privy to a lot of conversation information that a lot of people don’t see in education. It’s a very, very dirty business, you know, a lot of it has nothing to do with teaching or learning. A lot of it has nothing to do with the interests of the student, you know, there’s a lot of stake holders involved like external assessment and people trying to keep their jobs and decisions are made based on that and not really what benefits the students. Seth Godin once said it best, he said, you know, business schools have a monopoly on business education from the 90s. It’s so outdated, because you can’t change a curriculum that easy, because if you change a curriculum, you’re going to upset the other stake holders being the assessment holders, people that actually provide the assessment, which are making a buck. When you say provide the assessment, what do you mean by that? What does that mean? Provide the assessment? So, usually in universities, there is an external body that provides the assessment, so that the university itself doesn’t actually create the assessment, so for example, and this goes with anything, not just business or any other, you know, even language, like if I wanted to learn a new language, there’s external assessments that are created by, you know, organizations and these are seen as the standard for that proficient in that language or that subject or whatever it is. So, the university has an agreement with these assessment bodies so they obviously are going to make money off of that and they don’t want to lose that contract, so if, for example, you wanted to change a curriculum and you’re going to teach things that are not on the assessment, you know, you’re going to sacrifice either 1) your contract with the assessment or the students are going to be like, well, this has nothing to do with the assessment, how in the world does it, how am I going to pass this? I didn’t learn this? So, the safest thing is to just teach what’s on the assessment, which is not governed by the university. And that changes just far too slowly, right? Like Seth Godin said, you know, education from the 90s and the world has massively changed since then. Yeah, a lot of that is these contracts with these assessment bodies are not one or two year contracts, they are five and ten year contracts, so if I wanted to change something and there’s still, you know, six or seven years on the contract, you know, call me in seven years, maybe we’ll think about it. Unbelievable. Omar, just out of curiosity and I know we’re getting a little bit on a tangent here, but it’s quite interesting what you’re saying, what are the names of these assessment bodies or companies that do this? There’s a lot of different ones depending on the country you live in. I mean, obviously Cambridge is a big one, Oxford is another one. Like, they have their own assessments and they are a group of – it’s a large, large business, especially in academia, higher academic, especially in the language world as well like, you know, people want to immigrate, people want to go to college in different universities in the West, that’s kind of how it got started and basically what happened they just outsourced every other kind of assessment. Now, not all universities do this, but the larger ones that have larger curriculum can’t handle creating assessment for so many subjects, so they have a separate assessment body that they refer to. Very, very interesting. Okay, let’s circle back and talk about podcasting a little bit more. So, other tips on being successful and getting noticed as a podcaster? How did iTunes pick you and designate your as the best of 2014, for example? There’s a few things. One of them is, I realized that without an audience I don’t have a show, so I need to give the audience what they want. When I started to research and tried to figure out what show I wanted, I started to go on forums, I started reading people’s comments on different blogs or different podcast show notes that were in my genre and I realized that lot of people were very, very tired of too much kind of banter or too much, like, filter and not getting to the point and some people were like, wow, this episode is an hour and a half long and I don’t have that much time. So, I just realized that some people need, you know, not all people, there are people out there that need something more concise and something that’s a little bit more direct. You know, fun and lively and great and entertaining, but at the same time that you’re not, you’re not prancing around the subject before you get to it. So, Omar, I wanted to ask you, so what do you think the latest football scores and how’s your vacation going and …you know. Well, let me tell you, Jason. Exactly. I couldn’t agree more. I gotta tell you, even Tim Ferriss does that and I just think, I like Tim Ferriss’s content, but his show, it’s too much banter. Well, I mean, there are some people that enjoy that. There is a listening for that. Who, why? Why is there a listener for that? But my point was is that the market of the people like you and I that really are not looking for banter right now, are looking for information, was under served, so I really felt like if I came in and had something new and fresh, I think people would say, okay, this is something refreshing. It’s a daily podcast, it’s ten minutes, it’s easy. Like, everybody has ten minutes, you can do it when you’re walking your dog and do it while you’re folding laundry and it’s very to the point, actionable. A big part of the reason why we’re successful is because I understand how to teach. I am an education, I know how to put a curriculum together, I know how to put a listen together. I know how to make sure that comprehension is taking place. Every actual lesson or actually episode is scripted and planned out and I rehearse it. There’s a lot of production involved. A lot of people think I just sit there and just wing a whole bunch of episodes, you know, but I actually plan these things out. I take a few takes and then Nicole in the editing bay, she takes the best take and my guess is iTunes realizes that this is a new type of show that we haven’t seen a lot of and the quality is good and it’s thought out and the biggest feedback in reviews and our iTunes reviews, we have over 330 international reviews at this point and most people say I’m learning a lot in such a short amount of time and that is very hard. That’s very hard to actually craft. A lot of people don’t understand that takes years of experience of teaching to understand how to actually convey a good amount of information in a short period of time, because I had to do that, because I had deadlines of getting a curriculum done in a certain amount of time, because the assessment was at a certain amount of time. So, I knew that I had ten lesson, each lesson is X amounts of minutes and I have to get this much information out there, so that was part of the actual implementation plan of the podcast, so a lot of people enjoy the way it’s formatted and the way I deliver it. I think it’s just because it’ a new kind of show that iTunes kind of recognized and we put a lot of effort into and we actually had a very, very successful launch. In a lot of ways we broke some records in New and Noteworthy. We were number one in New and Noteworthy for four different categories for five straight weeks, which was, for me, it was a shocker, but I want to say it was luck, but we put a lot of work into the launch. We really, really.. So, tell us about your launch strategy, like, what did you do when you say a launch? I launched several podcasts, but a lot of them I just put them out there and start it. I didn’t really think about gaming the New and Noteworthy system very much or – when I say gaming, I don’t want to say that as though it’s a pejorative ting, you know. I just kind of put the content out there, but in the internet marketing world, that’s very built around the concept of having a product launch. Apple is very good at product launches, but some companies just put a product out there and some of them do pretty good too, but what was the launch strategy or even the launch sequence? So, basically, like I said, I wanted to launch the podcast like I wanted to launch a product, so we planned the launch two months before, so there’s a few things that we did. One, you know, we created buzz within our own community. We had, you know, the whole website up and we had an opt-in page where people can get more information and we had some teasers that came out. I did a few guest spots and I say I had six guest posts released the same day that the launch of the actual podcast. So, the podcast launched August 11th, so when I contacted all the people that I wanted to guest post for, some large and some small, you don’t have to be, huge, huge websites. Some of them were huge like Digital Photography School, Darren Rowse’s website gets millions of visitors a month or his got millions of subscribers actually, but.. When you say guest post, do you mean a blog out, a text blog post? Yes. A text blog post where I actually write an article, you know, 1,5000 words, something like that, so when I contacted them I told them, you know, I want this released on the 11th specifically because that’s the day I’m launching my podcast. So, in addition to the six guest blog posts, I also guested on four different shows on the same day. The same thing, I would record and say, listen, I’m launching a podcast on this day, I’d like to have it released on that day, so you know, the point is that you’re everywhere that day and that you’re hitting from all cylinders and in addition to that, I also made sure I’m a part of different communities. I’m part of different blogs and different communities that people can ask questions and before hand. So, we’re back in that community days before the launch saying, hey guys, I’m launching this podcast, I would love for you to subscribe to it. If you’d like to give review, if you’d like tell your friends, that’ll be great and just create this sense of content marketing as much as possible. Now, that’s not easy. A lot of people don’t do that because that’s a lot of work. You know, writing six blog posts is very hard, you know, and they have to be unique and they have to be catered to the actual website and the reader of that website and then you have to create content that leads to it, so like after writing the blog post at the end I have something that says, if you like this information that I wrote about, then you’d love this free course that I put up together, a video course, it’s seven videos, it takes about this subject and if they sign up for that video, they get an email talking about the podcast launch. So, there’s a whole sequence of things that are going so that people are aware of what I’m doing, I build trust with them, because I don’t expect people to just check out my podcast because I said so. I need them to, I have to earn their trust, I have to give them something in exchange for their time, so if they like what they read, if they like the course or whatever I give them for free, then they’ll say, hey, I think I’m going to check out that podcast, I want more of this and that was my strategy. Omar, you talked a lot about preparing and designing a curriculum and things like that, share some of the tips that you have for podcast about your work flow. Are all the interviews, there are a combination it looks like of having a guest and it’s so funny, I noticed you had Noah Kagan. I had him on my show and that’s the only one that’s explicit. That just made me laugh. Some of them you’re doing yourself, some of them you’re doing with guests, or what’s the mix there? Every single episode is a lesson. The whole content or the whole purpose of the show is to provide you with content that you need as a business builder. Every ten episodes we have a guest teacher who teaches a lesson as well, so you get a break from my voice and you get a guest teacher, so for example Noah Kagan – I approached him and said, hey Noah, you’re really good at building strong responsive email lists quick. I think our audience would love to hear from you, would you be interested in teaching a lesson in that eight to ten minutes and he responded and said, yeah, I would love to. We have a format where we send them a PDF of the format of the show so they understand like, there’s an intro and there’s meat to it, there’s a summary, so I sent that over. He recorded it. We took a look at it. We edited it, I put my intro to it, I had mine words afterwards, my commentary of his lesson later on and every episode we end up, I end up with a word of advice, I say I want to leave you with this and I give a piece of advice that has something to do with the lesson and it usually has to do with my experience, you know, like with that episode I might have said something like, building a list is not something that happens overnight, you have to be patient, you might get some subscribers and you also might get some unsubscribes, so don’t get discouraged. This is part of the game, it’s part of the system. It’s your right of passage. It’s you every time and then a guest, we’ll call it a guest professor, maybe, every tenth show, right? Okay, got it. So, we alternate Mondays. So, every ten shows will have a guest teacher and then, for example, like this Monday we had Noah Kagan, next Monday we’ll have different type of show, which is called a must read show. When I started learning about entrepreneur and business and started my own businesses, all I had to my disposal was books, because, you know, the internet was very young, it was 1999-2000, you know, there were no WordPress, no blogs, nothing, so I had to read books. Are we suppose to feel sorry for you? I’m saying this is where I got most of my experience or information or knowledge, so on that episode I have a must read episode where I talk about a book that greatly influenced me as an entrepreneur and I tell the listener why they should read the book. I give a summary of the book and talk about what are some of the takeaways and some of the things that you should forward to when you’re reading it. Okay, so, work flow. Do you record for example, like, John Dumas, right, he records all his episodes on Monday, eight at a time, so he has more, he’s always ahead, quite a bit ahead, and so he’s got some pretty good work flow stuff that I’ve noticed, what tips on work flow? That’s content and that’s really interesting what you just said. Do you record in batches? Do you record everyday? What do you do there? So, in terms of work flow, I do batch. We do batch episodes. I’ll probably do five or six episodes in a day. Recording days are Mondays and Tuesdays, after recording them, I would hand them over to Nicole who does all the editing and the mastering and makes sure all the music is in the transitions and all are sponsorships spots are live reads, so I actually do all the sponsorships when I’m actually doing the episode. So, they are all part of the episode, so there’s minimal work when it comes to that and then she ID3s them and puts them up on SoundCloud and then we have an employee that actually does all the WordPress stuff and social media for the podcast. So, we do batch, but a lot of the time it does take place in the planning of the actual episode of sitting down and looking at the whole year and maybe even just the next month and looking at, you know, what lessons we need to cover, how they’re building upon each other and taking look at the topics that we need to kind of teach in the next few months, so yeah, I mean, that’s our work flow in a nut shell. How do you get sponsors for your show? I wish I could tell you, because I actually never reached out to sponsors and I wasn’t really focused on getting sponsors in the beginning. I wasn’t really sure how many downloads I needed or anything. So, I just focused on having a really, really good show that’s popular that people enjoyed and sponsors started reaching out to me. You know, they started checking out our website and went to our contact page and reached out to me and that’s kind of how our sponsorships started and then when we won the iTunes Best of 2014 Award, that kind of opened all the gates and people just started contacting us after that. What kind of contract to write and to have them sign and so forth? Luckily Nicole and I are friends with John and Kate. John Lee Dumas and Kate Erickson. They live like ten minutes away from us so, I was able to ask him and just say, hey man, I’m getting these people company and I asked him and I asked some other people as well. Michael O’Neal from Solopreneur Hour who is also in San Diego and they just gave me their advice and where to start and that helped. Good, so what are your goals for the show? My goals for the show is to just improve in terms of the quality of the show and the production quality of the show as well as just, it’s a mission or it’s a challenge in itself to stay consistent, to stay – keep the quality up and make sure that people are enjoying it. I want to grow the audience a bit more. We are currently at 15,000 listeners a day, which is good and very notable in the business world, but in the podcasting world, it’s a drop in the bucket, you know. This American Life gets a million, but that’s fine. I’m trying to grow slowly and build our audience and I just want to create awareness of this idea of alternative business education. A lot of people that come to our show and listen to the show and learn about The $100 MBA, it’s kind of like a light switch just switched on, like oh wow, I just never thought of it this way and I want more of those moments and hopefully we continue to produce great quality content will come to the show. Good stuff and who are your listeners, Omar? Are they mostly startup people? Are they mostly young or is it middle age people that are getting out of the corporate world? What’s the demographic? We have a pretty wide demographic, but I would say the bulk of – we did the survey with our listeners. We asked them to fill out a survey, but the bulk of our listeners are between the ages of 25 and 35. I say that’s like 40-45% and then we have students that are in business school or students that are in their bachelors thinking about going to get their MBA. We have people that are middle aged or thinking about transitioning jobs. We have a pretty wide range, but most people are on this, they’re in this area of, I want to do something different. I just don’t know if I know enough or I have the information or I have the skills. I need to have that foundation and that’s kind of where they start, they start The $100 MBA and hopefully we can take them there. Most certainty, great. This is great. The alternative education, I love it, I love what you’re doing. I just got to ask you, you don’t have to answer, but I’m going to throw the question out there so, tell me no way if you want, but do you care to share any of the income that you receive from the show? Not share the money, but the data so podcasters can know what their goals might be, what their aspirations might be. I’m not going to share our personal data. I mean, this is just a principle that Nicole and I have agreed on that – I know some people do this to inspire people, they have income reports and I know people that do this every month and I see the purpose for it, but for me, one of the thing I do discuss in The $100 MBA is that everybody has got to define their own meaning of success, their own meaning of wealth or whatever that is. I’m not of the camp that feels that I need to define it for them, you know, I think other people should know, you know, if you cover your expenses, for me, that was my goal when I started out, if I can cover my expenses and be able to live the same level of lifestyle as I did when I had a job, then I’m successful. That’s it. I’m fine. Anything after that is gravy. So, luckily I’ve surpassed that, but I don’t subscribed to the opinion where people need to shoot for millions of dollars or whatever it is. You have to find out what that means to you, because you are the one that has to be held accountable to that. If you say you want to make a million dollars a year and that’s your goal, you gotta hold yourself accountable, but I encourage people to make out their own number or make out their own level of success, but a lot of people can make a good living with podcasting depending if you do record daily or if you record, you know, twice a week, three times a week. I know podcasters that record three times a week and live off their sponsorship money. Depending on how many downloads you get. I mean, if you are looking for sponsorship, it’s very hard to kind of just do that alone. I would have a product that does support your content and away for you to promote your business, you know, I don’t believe – I believe in a holistic point of view and building a business on a company and building team around what your content is all about. Fair enough. You don’t have to explain it too much. I just thought I’d ask. You know, what you said, Omar, I thought was so good about the alternative education and you know what has amazed me, just kind of getting back to that issue for a moment, is that we’ve got all this create technology out there, you know, I know a lot of younger people who are in college or just recently graduating from college and got most of their degree online and doesn’t it just amaze you as much as it does me? That colleges have used technology to scale and really become more efficient where there’s no marginal cost increase for them to scale out the education, yet the prices are only going up! I mean, that is just amazing, isn’t it? Someone can listen to your show and probably get a more practical MBA. Yeah, it’s just an evaluation of what you think you’re getting and if people get that their investing in a career, like I will pay $50-60-80,000 for this degree, because I have the belief that this degree will get me a job that will get that return, but there is no guarantees and there’s no guarantees in anything you do in life, in anything you study. So, you kind of got to look at what’s my return on investment? You gotta feel a little bit more pragmatic about it. You know, it’s hard to break old habits. It sure is and a lot of it has to come from the corporate world. You know, thankfully Google recently said that they were going to hire people that didn’t finish college, you know, maybe that’s changing, maybe the needle is moving a little bit and the non-traditional. With my charitable foundation, I support the Khan Academy every year and Wikipedia and some of these alternative things and I really like. I like what you’re doing. So, good stuff. Keep up the good work and give out your website and any final tip you have. Sure, you can find out about The $100 MBA at 100MBA.net. They can check out the show, the podcast, at 100MBA.net/show and any free tip. My only tip is, for the moment, is when you’re creating anything a podcast, a course, a business, you really, really need to focus on figuring out what your customer wants. You want to create something that your customer wants and not what you think is brilliant. A lot of people fall in love with an idea and they forget that the idea is worth without an audience of somebody to buy this product. This is such a powerful topic that Nicole and I created a course on it called the Five Steps of Idea Validation and if your listeners would like, they can pick it up for free. It’s a full video course with a work book and they can check that out at 100MBA.net/free-course. Excellent. Well, excellent advice and thank you so much for sharing all of this, Omar. Omar Zenhom, thank you for joining us. Thanks Jason. I love your show and I love what you’re doing. individualized advice. Opinions of guests are their own and the host is acting on behalf of Platinum Properties Investor Network Inc. exclusively.